I think I’m about due for another biscotti recipe, don’t you? I’ve said it before and I’ll say it again… I could make biscotti all the time and bring you one a week if time/my health/general kindness to the food blogging world didn’t matter. There’s a good chance you hate biscotti, and that’s ok, but I’m still going to keep making it and sharing recipes with you every once in awhile. I think biscotti are my love language. Them and cheese. Ohhh, and 1000 Island dressing. And all of these things. Yes, one of each, please. So this is my contribution to the grouping of “St. 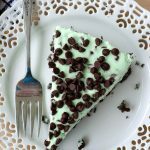 Patrick’s Day recipes” this year. Last year, I did much better with my Irish soda bread and skinny Shamrock Shake. 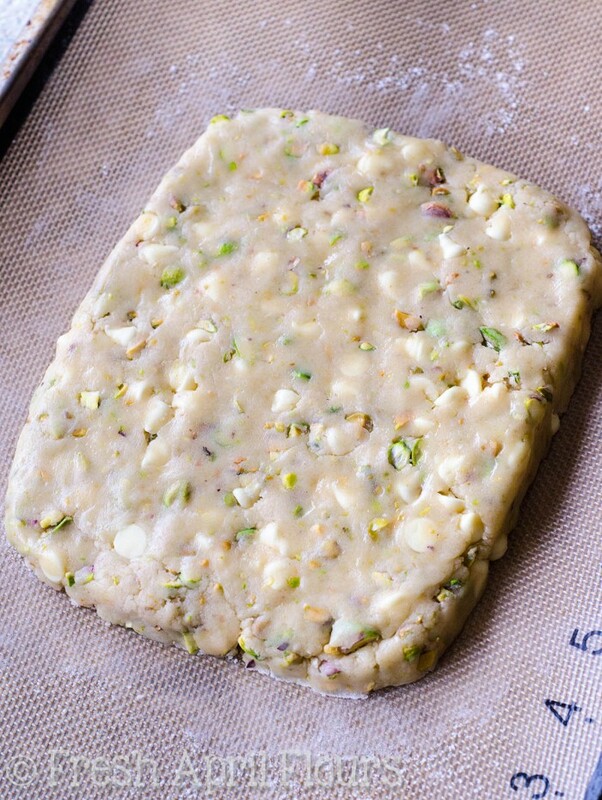 This year, I’m ironically making a traditional Italian cookie into a celebration of an Irish holiday, but… I am both, and pistachios are green, so… Humor me. Now, because I have a few other biscotti recipes on the blog already, I didn’t take many (ok, any) of the assembly/cutting process, and it was also pretty dark by the time I got to whipping these up, so… Check out my funfetti or lemon poppy seed biscotti for detailed photos on exactly what this process looks like. I assure you, though, it’s really quite simple. All of my biscotti recipes start the same way: some melted butter, some vegetable oil, an egg, flavored extract (vanilla, in this case), and granulated sugar. That’s your wet team. The dry team consists of flour, baking powder, a bit of salt, and then add-ins. 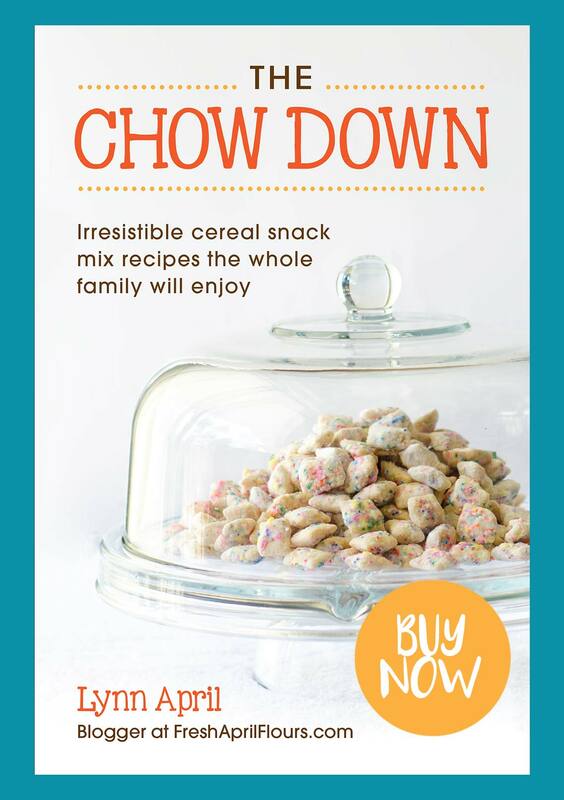 In this case, we’re working with pistachios and white chocolate chips, but I think you probably knew that already. Now, about these ‘stachios… I shelled mine myself. Why? Because it costs over twice as much to purchase them already shelled. I mean, after shelling them myself, I can see why (labors of love are my favorite), but you’re welcome to go either way on this one. Just make sure you use roasted salted. Because the biscotti themselves are fairly sweet and we’re adding a hefty dose of white chocolate chips, you’ll be happy that saltiness is there to offset all of the sweetness. If you only have or can only find unsalted, that’s totally fine. 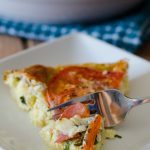 See my notes in the recipe for how to adapt the recipe. Once everything is combined, you’ll pat the dough into a slab. I aim for a slab measuring 6″ wide and 7 and 1/2″ long. This yields the perfect size (in my opinion) for my biscotti. It’s helpful to use a ruled silicone baking mat or measuring tape to get the right size. Give the biscotti dough a nice egg wash (for that beautiful shiny finish), then bake for about 20 minutes, just until it turns golden brown. Remove from the oven, and while keeping the oven on, allow the slab to cool for 10 minutes. Then, cut it into 6-1″ logs, then perpendicularly down the center of all of the logs. Then, you’ll flip each individual biscotto onto its side, bake for 9 minutes, flip to the other side, and bake 9 minutes more. 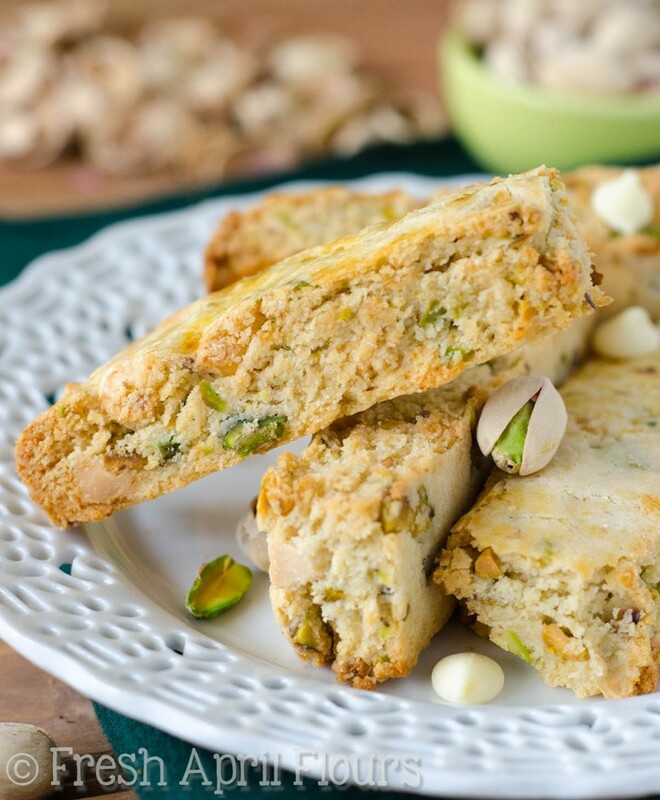 Allow to cool and then you’re left with perfectly crunchy pistachio white chocolate chip biscotti that are perfect for dunking or just eating straight up. 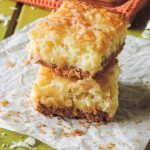 I loved this particular flavor dipped in milk, but coffee, tea, whatever it is you’d normally dunk into– give it a shot. I suggest trying it with all different beverages so you can keep taste testing! ???? Matt has graciously tried everything I’ve ever baked, and he could not get enough nibbles of these biscotti. He said he couldn’t decide if this flavor was his favorite or if his heart remains with the funfetti variety, which is saying a lot, because hellooooo, sprinkles (who can deny those colorful little guys?)! I’ll tell you what, as much as I am not a huge white chocolate fan, combining white chocolate chips with salty pistachios was such a good idea. And in my favorite kind of cookie? 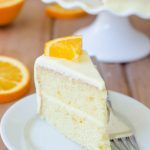 No doubt this was one of my favorite recipes as of late. Next to this soup. If you haven’t tried making biscotti yourself yet, now is the time. Because I’m just going to keep making scrumptious biscotti flavors for you to try. I love them because 1) they’re easy 2) the recipe only makes 12 cookies and 3) THE DUNK FACTOR. 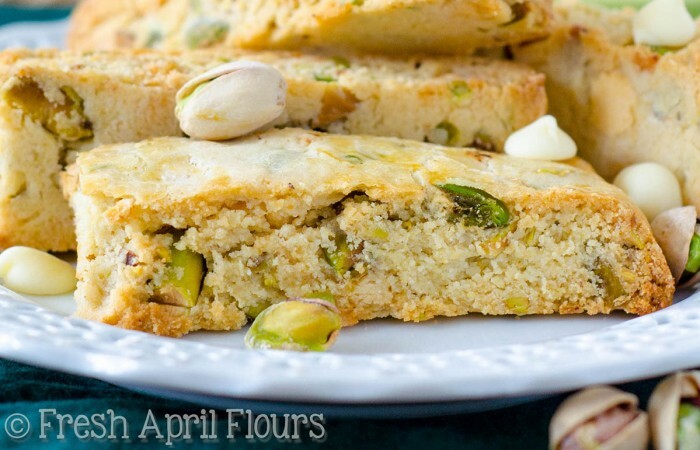 Join me in a pistachio white chocolate chip biscotti to celebrate St. Patrick’s Day. Remember: pistachios are green so IT WORKS. 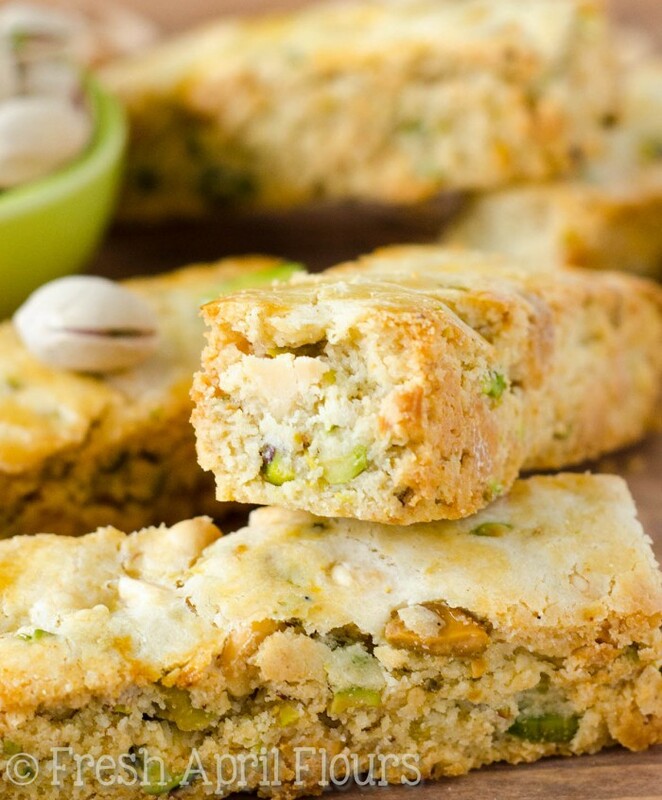 Crunchy biscotti dotted with salty pistachios and sweet, creamy white chocolate chips. Preheat oven to 350ºF degrees. Line a large baking sheet with parchment paper or a silicone baking mat. Lightly flour the baking sheet. Set aside. In a medium size bowl, whisk together butter, oil, egg, vanilla, and sugar until combined. Set aside. 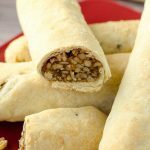 In a large bowl, toss together the flour, baking powder, salt, pistachios, and white chocolate chips. Add the wet ingredients to the dry ingredients and gently mix with a large wooden spoon or sturdy rubber spatula until everything is combined. Turn dough out onto lightly floured baking sheet and, with floured hands, pat dough into a rectangle about ½" thick. My rectangle was 6" wide and 7 and ½" long (using a ruler or a ruled silicone baking mat is helpful here). 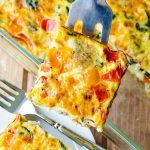 Brush entire slab (top and sides) with egg wash.
Bake dough slab for 20-22 minutes, or until the top and sides of the slab are lightly browned. Remove from the oven, but do not turn off the heat. Place baking sheet on a wire rack and allow to cool for 10 minutes. Once the dough is cool enough to touch, cut into 1" thick slices using a sharp knife. 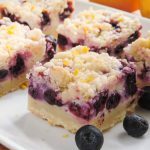 Cut these 1" slices in half, making a perpendicular slice down the entire slab. Set slices cut sides up on the baking sheet. Return to the oven to bake for 9 minutes. Remove from oven, turn biscotti over, and bake the other side for 9 minutes. Remove from the oven and allow to cool for 3 minutes on the baking sheet (cookies will become crunchy as they cool). Transfer biscotti to a wire rack to cool completely before serving. Biscotti stay fresh in an airtight container up to 2 weeks. 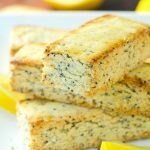 Baked biscotti may be frozen up to 3 months. 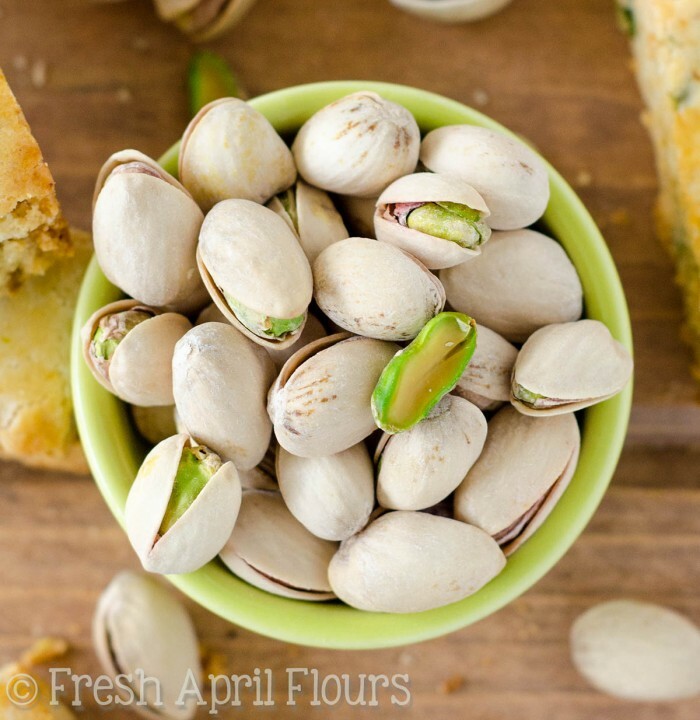 *If using roasted unsalted pistachios, increase salt to 1/4 teaspoon. 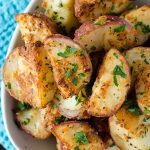 Check out all of my St. Patrick’s Day recipes. 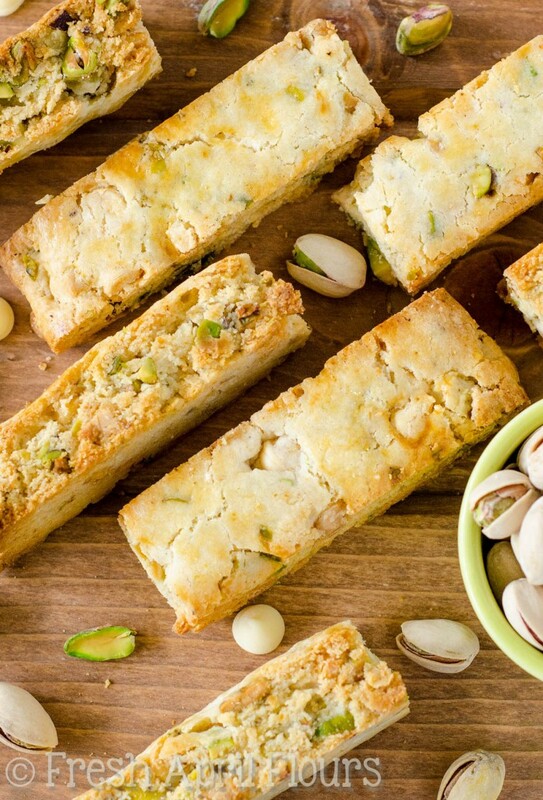 Right this way to all of the biscotti. Love nuts? 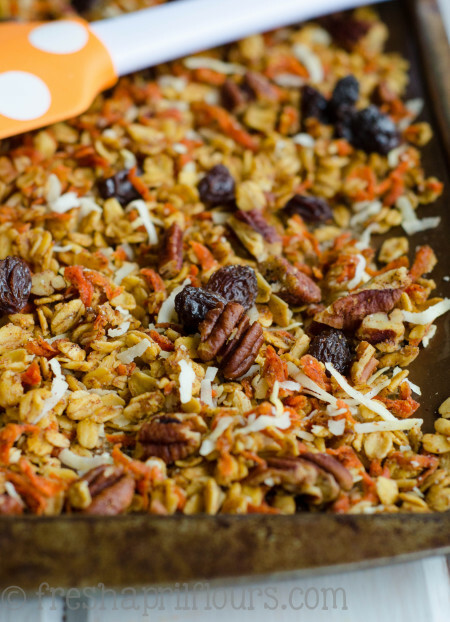 Try my Soft-Baked Carrot Cake Granola next! 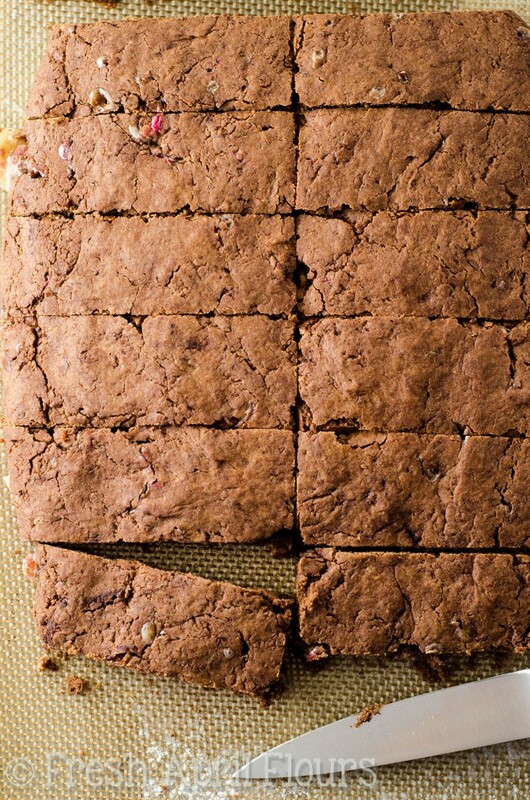 There can NEVER be too many biscotti recipes in this world. Keep bringing them on! 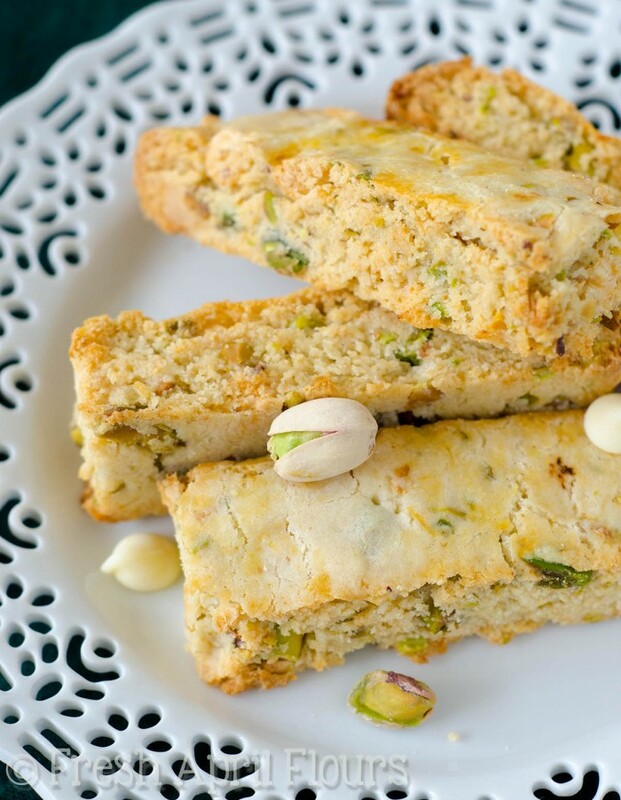 I looooove pistachio biscotti and am obsessed with the fact that you added white chocolate chips straight to the cookie. I can only imagine how wonderful these are dunked in coffee when the white chocolate juuuust begins to melt. HEAVEN. I was planning to make Anthony more orange cranberry almond biscotti this afternoon BUT I may have to shift my plans a little now…. 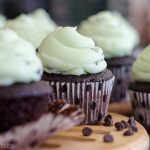 I think I’m going to have to make these for St. Patrick’s Day! Even though we don’t have a drop of Irish blood in us, my great-grandfather (who is turning 91 this year) was born on the seventeenth, so it is a special day for us, after all! Ahhh biscotti. 91!! Great for him!! I think he definitely needs some biscotti in his celebrating. And something else a little special I have planned for Monday! Also, I LOVE BISCOTTI! Especially all the delicious flavours that come out of the Fresh April Flours kitchen! 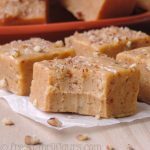 I need to get shelling and converting this to an Amy friendly recipe because I can already tell that I won’t be able to get enough of this recipe either! Hahahahaha, I can just picture Chris right now doing that. What a goofball! I’m so glad you share my love of biscotti, Amy! It’s such an underrated cookie in my opinion. 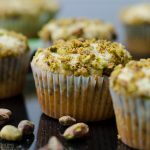 I think you need to make a GF version happen for yourself soon, because pistachios + white chocolate are my new favorite love affair! Hi! I saw these on an impulse this morning and decided I had to make them! This is my first time making biscotti and I like how they turned out. Thanks for the recipe! Great, so glad you enjoyed them! Thanks for reporting back, Nathalia. This did not turn out for me at all. The dough was way too dry that it couldn’t form. I added a couple tablespoons extra of butter and another egg white and it still wasn’t crumbly. I’m not sure what went wrong. Perhaps I did not chop the pistachios fine enough. I’m sorry to hear that, Tiffany. I use the same base biscotti recipe for ALL of my biscotti, and I never have a problem. I hope you’ll try again! Yes, I will try again! It was my first attempt at biscotti so maybe I just need to practice. 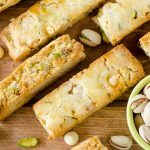 I made your pistachio biscotti recipe about a year ago and brought them to work. They disappeared so fast I forgot how good they were until I made them again yesterday. I read a little more about you and was pleasantly surprised when you mentioned Pronios. I know that little market. I was raised in an Italian family in the Pittsburgh area. 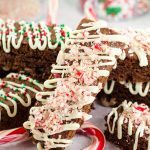 My mom made the typical anise biscotti then later in her life made a version with candied cherries and pecans (no anise). I didn’t eat biscotti. I thought they were too hard. I now experiment with all kinds of biscotti. Your recipe is different than most I’ve seen by adding oil. I like it. 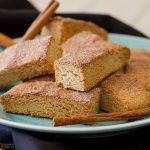 Have you tried coconut biscotti? I was checking to see if you had a recipe. I will be doing a lot of baking for the cookie table at my daughters wedding in May. It will be a cookie/candy table since we live near Hershey. I made the pistachio biscotti for her shower this coming weekend. Thank you for your recipe. This makes me so happy! And what a small world! I have not make coconut biscotti, but I have considered it. I actually would love to make a whole blog devoted to biscotti, because I just love making them so much. So if/when I do make one, I’ll be sure to let you know!